Once again, the elegant white wave of dinner guests will invade one of Sacramento’s most prestigious public locations. For this second edition, more than 1,500 revelers will descend on a new and secret location. 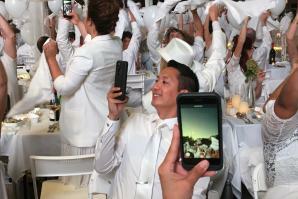 Le Dîner en Blanc returns October 7, 2017. Phase 2 is for new members who are referred by Phase I attendees; Phase 3 is for people who sign up on the waiting list via the official website:sacramento.dinerenblanc.com/register. Once confirmed, guest participation becomes mandatory regardless of weather conditions. This is a rain or shine event. Dress code: elegant and white only. Originality is encouraged and attire should be stylish and tasteful. As per California law, guests cannot bring their own alcohol. Those wishing to enjoy wine or Champagne can select from a variety of pre-sale options through the Dîner en Blanc’s e-store. Guests are welcome to bring their own non-alcoholic beverage. 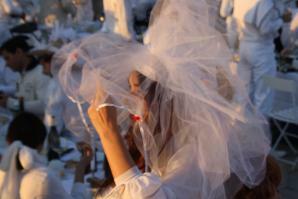 To ensure that the location is kept undisclosed until last minute, guests meet at assigned departure locations and are escorted by Dîner en Blanc volunteers. A table, two white chairs, table settings and table decor. To register for the waiting list, click here.